Free download All Free ISO Creator latest version. 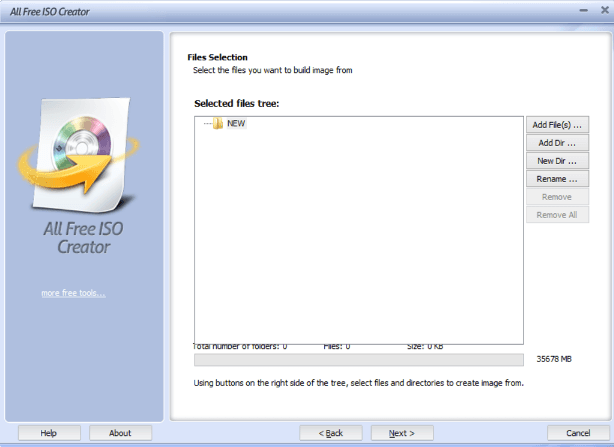 It is a free application to create ISO image files. All Free ISO Creator is developed by AllFreeVideoSoft Co., Ltd. Although there are various ISO image creators such as UltraISO and PowerISO but they are trials and you have to pay for them. All Free ISO Creator provide you a full solution with no price. It is absolutely free and can create ISO image file for you with some simple steps. How to create ISO image file using this software? Remember to add .iso file extension at the end of file name. Now click on next button. You are asked to select the file system type. I recommend to keep it by default. Otherwise you can select ISO9660 with Level 1 or Level 2. Now click on Next button and choose either you want to create bootable image or not. If not then proceed with next otherwise you have to browse for boot image file to make this ISO bootable.